Lieutenant Colonel (Retired) G S Prendergast joined the Jamaica National Building Society in January 2014 as Executive, Administration. 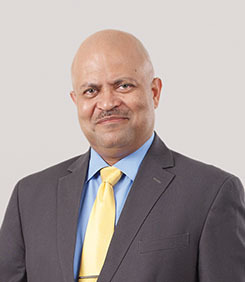 He was appointed General Manager of JN Properties Ltd. in June 2017. He has served as a Commissioned Officer in the Jamaica Defence Force (JDF) for over thirty (30) years and was previously seconded from the JDF to the post of Commissioner of Corrections, Department of Correctional Services during the period 22 March 2010 to 30 June 2013. He successfully completed an Officer’s Selection Board and joined the JDF in June 1983. He underwent basic military training and was commissioned in the rank of Second Lieutenant in 1984. He was promoted to Lieutenant in 1986, Captain in 1990, Major in 1998 and Lieutenant Colonel in 2005. Lieutenant Colonel (Retired) Prendergast has held a number of major military appointments, including Infantry Company Commander, Battalion Intelligence Officer, HQ JDF Assistant Staff Officer (Personnel), acted as the Training Major for the Third Battalion the Jamaica Regiment (National Reserve) and Commanding Officer of an Infantry Battalion. He was also appointed Standards Officer for the Caribbean Junior Command and Staff Course in 2002 and again in 2003.